The focus in this paper is on how rates of poverty and income inequality in Israel have evolved over recent decades and how they compare to other countries. 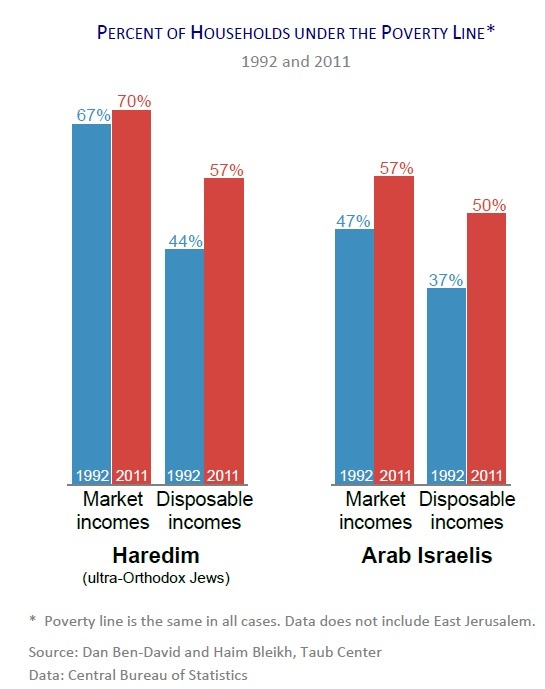 Contrary to conventional wisdom, Israeli rates of poverty and inequality in disposable incomes are very high – compared with developed countries – even after excluding Haredim and Arab Israelis from the sample (though not particularly high in terms of market incomes). Israel’s elderly population is the smallest in the West, and poverty among the elderly before welfare and taxes is among the lowest while after the social welfare net is spread, poverty rates in Israel are the highest in the developed world. Poverty among children after welfare and taxes is also the highest in the developed world. The share of national income received by the top 1 percentile is not particularly high in Israel, but the gap between individuals at the 90th income percentile and individuals with median incomes is the highest in the West – with the gap between individuals with median incomes and those at the 10th percentile even higher in Israel. A systemic plan to deal with the underlying problems and their symptoms is outlined here. This paper appears in the Center’s annual publication – State of the Nation Report – Society, Economy and Policy 2013.